In many cases, your content will introduce readers to your brand. You have to make this first impression count and lead those consumers to your salespeople. The best way to achieve this is by offering custom content—something that’s favored by up to 68 percent of consumers. This isn’t high school anymore; I encourage you to peek over at your peers’ work to see what they’re doing and how it’s performing. If you see that the infographics they tweet out every month are getting shared like crazy, you ought to consider making some as well. And if your biggest competitor is writing 2,000-word opuses that no one is engaging with, don’t waste your time on verbose, long-form content. 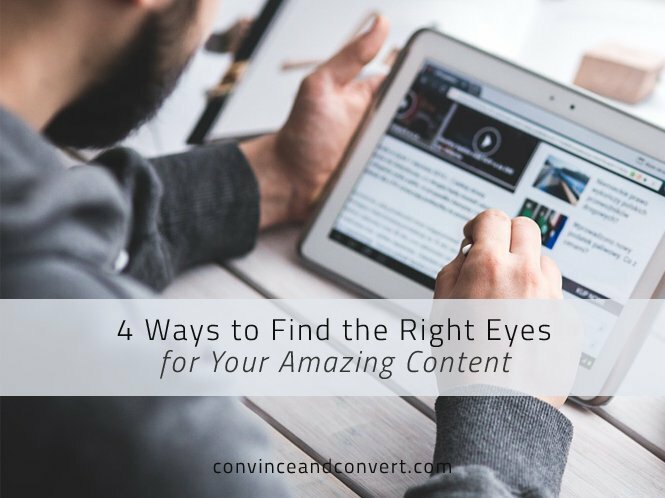 Constantly check in on the places your ideal eyes hang out, see what’s performing well there, and craft your content accordingly. When it comes to getting your content seen, your employees and their thousands of connections on social media can be incredibly helpful. According to Nielsen, peer recommendations are the most trusted form of marketing today, so encourage your employees to share and discuss content on their social accounts. Building and nurturing an employee advocacy program within your company will expose your pieces to countless more eyes in a trustworthy way.